Cialis is a treatment for erectile dysfunction manufactured by Lilly ICOS. Cialis works in a similar way to the popular impotence drug Viagra but there is evidence from clinical trials that Cialis has a longer period of effectiveness than Viagra. Cialis can remain effective for around 36 hours allowing a greater level of spontaneity than other impotence treatments which tend to last for around 4 hours. Cialis is normally absorbed into the bloodstream quickly and can be effective in as little as 30 minutes. Cialis is a prescription medication so you must complete a consultation form before you can buy Cialis online. Consultations are entirely free and you are under no obligation to make a purchase. Cialis is not appropriate for every man suffering from erectile dysfunction because it interacts with certain medications. When you answer our consultation questions, the doctor will let you know if Cialis is suitable for you. We will also assess you for Viagra and Levitra, the other two erectile dysfunction treatments which fall into the category of PDE-5 inhibitors. Although Cialis may have a longer period of duration than either Viagra or Levitra, you must remember that if you are unfortunate enough to suffer side effects from taking the medication, these side effects will also last for the length of time that the medication is active – this can be up to 36 hours. Cialis may not be the most appropriate medication for you but we will only be able to advise you on this once we have a completed consultation form from you. For most people, Cialis, Viagra and Levitra are equally appropriate but not always. Few people get side effects with Cialis but we have provided a full list of potential side effects picked up in the clinical trials in the pre-purchase guidance that is available after you have been approved. Some of the side effects that can occur with the use of Cialis are headaches, lower back muscular pain and indigestion. Not everyone will get side effects but it is important to make yourself aware of what might happen. Most of the potential side effects are quite mild. If you are confused about which erectile dysfunction treatment might be best for you, please do not hesitate to e-mail us or call our helpline and a member of staff would be delighted to assist you. We are not allowed by law to issue price lists for prescription medications. Any website which indulges in this practice is breaking the law and you would do well to avoid using its services. We regularly check the prices of our competitors and if you see your medication cheaper elsewhere then we will guarantee to beat that price so long as the website is verifiably based in the UK and offers an identical service. 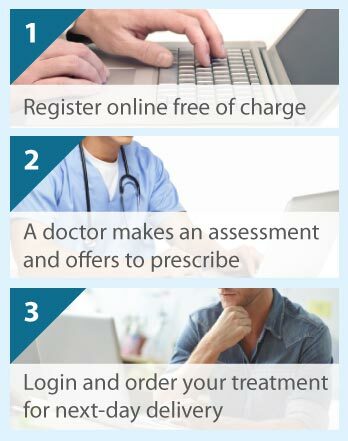 As a regulated clinic, we will never give out our patient details to a third party so you will never receive unsolicited e-mails as a result of registering with The Online Clinic. If after registering, you no longer wish to remain on our database, simply send us an e-mail and we will delete your records.